Editor’s Note: “An accidental chresmologue” is how Paul Saffo describes E.B. White. In his intriguing foreword to White’s Notes on Our Times, Paul explores White’s ability, accidental or otherwise, to write of mid-century matters that still matter more than 50 years later. Paul is uniquely qualified to speak of chresmologues, since forecasting the future is what he does. Based in Silicon Valley, with degrees from Harvard and Cambridge as well as Stanford (where he teaches), Paul is a predictor of technology’s impact on our society. Among other positions, he sits on the board of the Long Now Foundation, serves as an advisor to Samsung’s technology group and is a fellow of the Royal Swedish Academy of Engineering Sciences. Oracles move among us unnoticed, their plainspoken auguries hidden in the murmur of daily life, overlooked by all but the most astute of listeners. Over his many decades with The New Yorker, E. B. 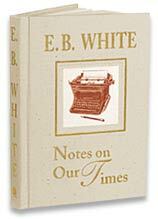 White became just such a listener as he wrote his incisive essays for the magazine’s Notes and Comment page. The essays in this collection first appeared in The New Yorker between 1937 and 1952, an interval framed by a waning Great Depression on one end and a waxing Cold War on the other. In between were the Holocaust, World War II, the atomic bomb, Walt Disney, the Iron Curtain, Chuck Yeager, television, the United Nations, and, barely noticed, the invention of the transistor and birth of the modern electronic age. Even when compared with events today, it was a period of unprecedented tumult and uncertainty. It was also a period when writers were not afraid to tackle the big issues head-on in print, as experts filled editorial pages and bookstores with their prescriptions for meeting the great challenges of the time. In contrast to these top-down explicators, White worked up from the specific in his understated way, leading the reader to a conclusion so self-evident by essay’s end that he barely needed to mention it. White writes about perennial human truths, but one must read these essays more than once to fully appreciate their timelessness. The first time through, the description of a modern pig nursery in “Remembrance of Things Past” is arresting for its mention of a long-obsolete piglet-comforting Victrola. But read again, the piece presages the issues surrounding humankind’s separation from nature and the safety of livestock antibiotics, issues that remain pressing concerns today. The Greeks revered their oracles because their utterances inevitably invited petitioners to look inside themselves for an answer. 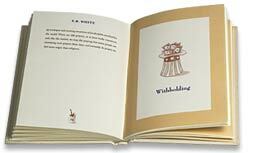 This is where White is at his very best, framing his essays in a way that all but compels introspection. “Sound” explores the impact of radio and long-forgotten political sound trucks, but it also speaks eloquently to the challenges raised by today’s tumultuous digital media revolution. White’s observation that “amplification, therefore, is something like alcohol: it can heighten our meanings, but it can also destroy our reason” resonates with worries today regarding the impact of the vast chatter in the blogosphere or the studied vulgarity of talk show hosts competing for listener attention. In the course of exploring White’s expository revelations, I carried these essays on more trips than I recall, covering more miles than I remember. His observations have resonated in surprising ways. I suggest that you, too, carry this book with you, allowing the connection between what is on its pages and what you see in the world to heighten your sense of the future as well as your appreciation of the past. © 2007 Paul Saffo. From the foreword to Notes on Our Times by E. B. 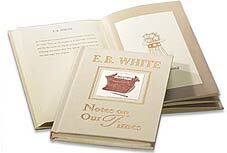 White, published in 2007 by Levenger Press.